2016-05-04 - STAR WARS NIGHT!! 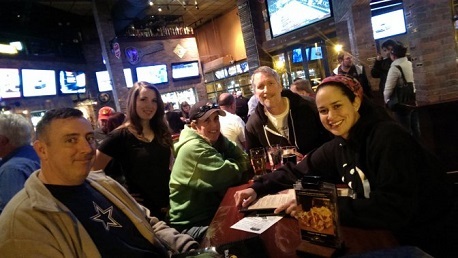 Thank you to everyone that came out to World of Beer Arlington for Star Wars Trivia night. More importantly, thank you for sticking with me and not getting too upset with my inability to pronounce many of the names, species, and planets from the Star Wars universe. Yes, the questions were difficult. But, after the last Star Wars night, and other themed nights, we felt we needed to add a few more difficult questions to spice it up a bit and separate the contenders from the pretenders. Maybe we went a little too far, but the mood of the evening was incredibly positive and everyone that came out had a tremendous time. In Game One, the weekly powerhouse team of Plc Trek To Gallifrey stormed out of the gates and never relinquished the lead. Finishing just behind and taking home a second place gift card was You Bent My Wookie. As we entered the impossibly difficult Power Hour, the scores fell but the mood came up. With perhaps the easiest PubGuys Kitchen Timer question ever, many of the teams received the necessary bump to get their scores into contention. Though the Kitchen Timer question read as the 11 different colors of a particular race/species in the Star Wars universe, the underlying question could simply be phrased, "Name 11 colors." With that in mind, the teams were able to bolster their scores to a respectable level. When the game concluded, The Scruffy Nerfherders had just been edged out for the top spot by You Bent My Wookie. And with that, another May the Fourth Star Wars Trivia Night was over. Congratulations to all our teams, and thank you again for the incredible support you show on these themed nights. They require a lot of work, and seeing the enthusiasm on your faces during the event makes every bit of the work worth it. Now, for that bonus point next week, let's try this. Take the number of career strikeouts by Nolan Ryan, subtract the career hits of Pete Rose, and the career stolen bases of Rickey Henderson. Tell me what current player for the New York Yankees wears that number. darth maul did nothing wrong!